Satoko Tawada puts up a good front. Eight years ago, her college boyfriend broke up with her, a rejection she clearly has not gotten over. The situation is exacerbated because not only does she work with her ex, but he’s head of her department and he keeps bugging her for an after-work drink. One day, frustrated, she picks up some beer on her way home and pops one open in the local park, where she watches a kid struggling at soccer drills. Once a player herself, she offers some pointers and discovers that the long-haired androgynous girl she thought she was helping is actually a boy, 12-year-old Mashuu Hayami. The park is on Satoko’s commute so she volunteers to coach him on a daily basis. But as she spends more time with him, she starts getting bad feelings about his home life: his dirty clothes, his constantly rumbling tummy, the mother who’s “not around” and the dad who, while it’s not clear, seems neglectful at best and possibly abusive at worst. The night of Mashuu’s soccer tryouts, Satoko finally caves in to her ex’s requests only to find out the friendly drink is an ambush to introduce her to his new fiancée. Dejected, she encounters Mashuu whom, despite his best efforts, did not make first string on the team. Both heartbroken, they manage to console one another. Before you know it, Satoko is completely entrenched in Mashuu’s life, doing things like driving him to soccer games and taking him out to eat, things no stranger has business doing with someone else’s child. Why is she doing these things? She has no idea, but the pair both seem to feel better with the other in their life. And isn’t that enough? 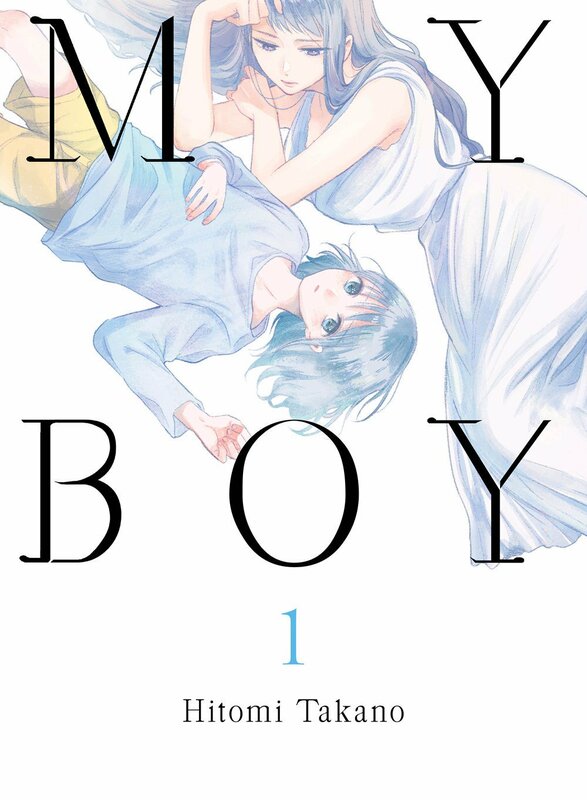 At first, Hitomi Takano’s My Boy gives strong flashbacks to Nick Hornby’s 1998 novel About a Boy, as both stories follow a lonely adult broken out of the cocoon they’ve created for themselves with the help of a young boy with troubles of his own that they have no business meeting, much less befriending. But though the two share thematic similarities, My Boy has a tone all its own. The story is told almost entirely from Satoko’s perspective and her narration, mixed with Takano’s artistic skill at subtle acting through facial expression and body language, dives deeply into her perspective as a 30-year-old frustrated single woman. Satoko’s mindset is what makes the book such a fascinating read, so much so that the third chapter in this volume, which centers almost entirely on Mashuu at school and a girl who may be developing a crush on him, feels superfluous when compared with Satoko’s story, which feels so much more lived-in. Takano’s josei art style drives home the story’s realism. Her characters are only lightly stylized, doe-eyed but otherwise drawn in a fairly realistic manner. Her layouts give the book the feel of an indie film, utilizing unexpected transitions (conversations or narration continues as the “camera” zooms in on a character’s hands, or empty plates on a dinner table) to keep an otherwise ordinary story visually interesting.